It's not uncommon to see someone with an ear full of piercings these days. What was once a trend has become the norm, especially among fashion girls, but that doesn't really mean that you should fill your ear with holes with no rhyme or reason. There's undoubtedly an art to piercing, and few people understand it as well as Brian Keith Thompson, the owner and piercer of the wildly popular Body Electric. I visited the Melrose Avenue shop on a recent trip to Los Angeles for a third piercing in my ear, and based on the crowd gathered in the waiting area that afternoon, it's very apparent that Thompson has quite the following. Since Thompson has been in the piercing business for decades and sets so many piercing trends, who better to get the scoop on the piercing mistakes he sees most frequently? Piercing is clearly a permanent thing, and it's best to be well informed going into it, so consider this required reading if you're in the market for a new one. 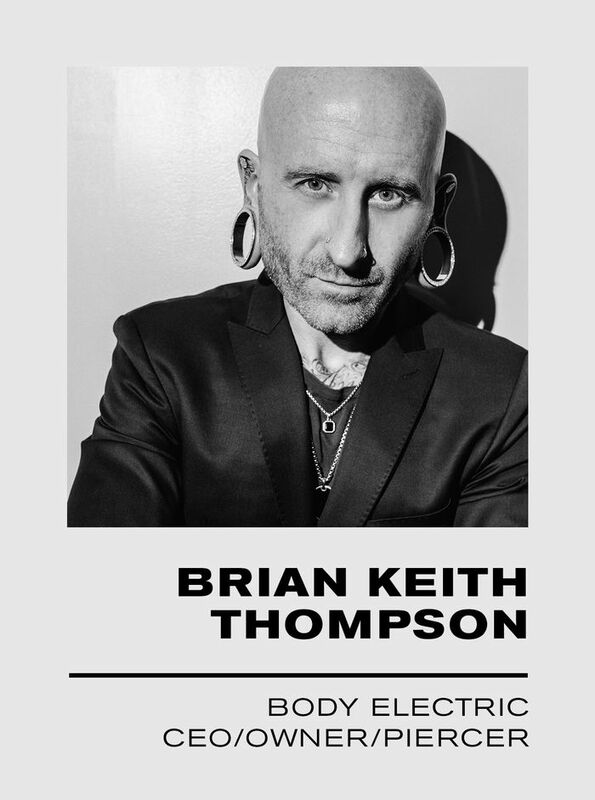 Scroll on for the four biggest ear-piercing mistakes Brian Keith Thompson sees, and to see some of his very stylish and un-cringeworthy piercings, and shop earrings that are perfect for multiple piercings. "A lot of people think piercing is just cause and effect. You go see your piercer, and that's it. But piercing is dynamic. There are two sides to piercing: One is the physical act of getting a piercing; it's the needle going through the body. The most important part—well, both are equally important, actually—but the other side is the actual decoration. Most of the time, I cringe when I see someone come in and they've spent a buttload of money and their ear is just not decorated. It's just like someone didn’t really give them time, didn't really care, and just placed the piercing sporadically like they were just shooting at a barn in the dark with a shotgun. Just no rhyme or reason. Now, I'm all for the constellation piercings. But even though they're sporadic, there is a reason I put things in certain places. So there’s a lot of cringe when I see a terribly decorated ear, and I'll tell the client that it's not just the act of decorating; it's putting jewelry in certain locations. Not all jewelry should go in certain areas. And a lot of times when clients come in, I'll tell them straight up when I don't like something. I'll tell them 'I don't like this. I don't like that. We need to redo this…' I'll actually have them take out misplaced piercings and then I'll redo them." Still not over opals (and probably never will be). Certain piercings look best with the tiniest of diamond studs. Now this is how to draw attention to a double piercing. "I've been seeing a lot of kids coming in getting pierced by their doctors, and their doctors' offices are telling them to clean their new piercings every day with alcohol. I don't understand that. Because if you grab your bottle of alcohol—rubbing alcohol—and you read the warnings, the first warning is, "Not for prolonged use." It’s for single applications. The body cannot heal if you're using alcohol every day. The only thing you need is soap and water. Mild soap, not even an antibacterial soap. My soap of choice is Dr. Bronner's—Baby Bronner's. But Cetaphil is great too." These special studs are perfect for everyday wear. Add some color to your ear party. "My third cringing moment would be seeing people come in and their ears [are] just extremely dirty. And that's from body oils, products that we use on our body, hair products, lotions, soaps. All this stuff starts building up, and it just looks like gunk on the jewelry itself. A lot of these clients don't have any idea that it shouldn't be that way, which just surprises me. So what I'll do is—I did with this client the other day: I took a piece of jewelry out of her conch. I didn't pierce it; it had been pierced for a couple of years, and you couldn't even see the gemstones any more. It was just covered in this—I just want to say gunk. Anyhow, I ultra-soniced it, tuned it up, cleaned it up, put it back in for her. I showed her a mirror and you should have seen her, she just lit up like a Christmas tree. She was so surprised she just couldn’t believe it. But that is a very cringe-worthy moment—I mean you’re carrying around bacteria, basically. It's not just visually bad, but it's also not sanitary. It’s a little gross. So clean your jewelry please." Trust me—champagne diamonds are as sparkly as their white diamond counterparts. This smoky blue hue is so chic. "Another one is, I'm seeing a lot of clients around my age, 40-something, and they're still wearing a lot of these old captive bead rings from the '90s. That ship has sailed. It’s not 1997 anymore. Those things were cool in '97, but they're not cool anymore. Especially the stainless steel ones: 16-gauge, 14-gauge stainless-steel captive bead rings. No, thank you. Now there are people out there who love them. Hey, you do you—go do your thing. I don't care. But that's not my style, that old-school stuff. Yeah, it served a purpose, but it's just not for me anymore. I'm trying to help my clients. I'm trying to show them another way and close that door forever. That big, bulky, stainless steel jewelry just isn't doing it anymore." You'll never want to remove this perfect tiny stud. This would look especially cool in a cartilage piercing. This is my earring of choice for my second piercing. These are the perfect size for first-hole piercings. Pearls are having a moment, so join the club. Next up, the nine jewelry trends everyone will be buying in 2019. These quotes have been lightly edited for length and clarity.